USGS measures groundwater levels in over 700 wells in an 11-county area annually in the Houston-Galveston area in order to develop a regional depiction of groundwater levels. The cumulative compaction in the Chicot and Evangeline aquifers are measured at 13 extensometer stations in the 11-county area. Water-level altitude contours, wells, and compaction data have been combined in an interactive map that allows users to view annual water-level altitudes from 1977 through the present, water-level changes over time, and historical time series of compaction data. Land subsidence is sinking of the land surface, caused by compressing the many layers of clay beneath the surface. In the greater Houston area, land subsidence is caused primarily by the withdrawal of groundwater. When we pump large amounts of groundwater from the aquifers beneath us, we pull water out of the many layers of clay, which causes the clay to compact. Some natural land subsidence occurs over long periods of time, due to natural settling but the amount of natural subsidence doesn’t compare to the subsidence rates caused by people. When large amounts of subsidence occur, the primary concern to residents is the increased potential of flooding. This is more of a concern when you live in close proximity to the coast. For example, the Brownwood subdivision in the city of Baytown is now mostly under water due to flooding. Upon its creation, the subdivision was situated at just 10 feet above sea level, and the area experienced 10 feet of subsidence from 1906 to today. Furtherinland, subsidence isn’t as evident because the relationshipto sea level is not as apparent, however the potential of flooding is still a concern. The most recentsubsidence map shows as much as 5 feet of subsidence measured in northwest Harris County from 1978 to 2000. Subsidence can be stopped but the land will never “bounce back”. Once the water is removed and the clay and soil compacts, it is incapable of springing back like a sponge. The best we can do is preventfurther subsidence from taking place. This can be accomplished when we stop pumping too much groundwater, and utilize alternative sources of water (surface water, treated effluent, etc.) combinedwith conservation. The Lone Star Groundwater Conservation District in 2012 purchased six Periodically Accessible Monitors(PAMs), which are specifically designed to detect subsidence. These units operate in conjunction with the two that have been monitoring land levels in Montgomery County for more than 10 years. Regular, precise, automated readings are taken of the elevation of the ground at locations throughout the county. The data is temporarily stored in an on-site monitor and periodically uploaded to computers at the Harris Galveston Subsidence District. The live data from the two older PAM units may be viewed by clicking on the Subsidence Monitoring Network Map (If you have Google Earth installed on your computer, simply click on the .kml file, and Google Earth will automatically open, showing you the network map.). Lone Star GCD is working with the Subsidence District to make the newer stations available online. 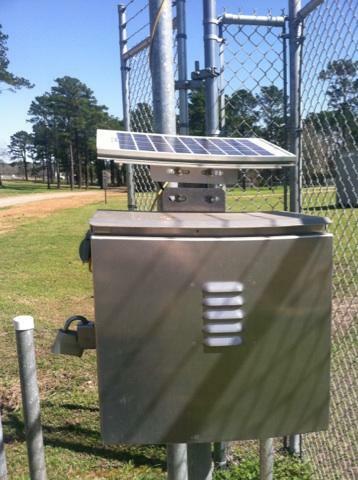 You can also view water levels by visiting the Lone Star Static Well Level Monitoring Network Map. Creation of the land elevation monitoring system, along with the implementation of the many Groundwater Reduction Plans now in place, will bring assurance that Montgomery County will avoid the many negative impacts of land subsidence experienced by our neighboring counties to the south.